Discussion in 'Canon InkJet Printers' started by Picard, Oct 22, 2018. Since I have a new Pro-100 and yet to be used, would it be better for me to purchase an empty cartridge from Precision Colors along with the inks to fill all carts for the 100 and never even run any OEM yellow through it? Just use the PC filled yellow cart from the git go? I am wondering if I use the OEM yellow cart that came with the printer that when it comes time to refill I will be replacing it anyway. And won't the ink that is in between the input port on the print-head and the print-head itself be mixing with the PC ink, or is it just an issue within the cartridge. Just use the PC filled yellow cart from the git go? You can do this and avoid the possibility of Yello Gello altogether. Or, use the OEM Yellow cartridge and then when empty use your refilled replacement cartridge from Precision Colors. 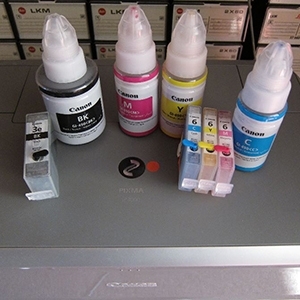 The ink maintenance purging that occurs after inserting the refilled replacement cartridge should prevent the formation of the Yello Gello within the print head. Yello Gello becomes a risk when you refill the OEM Yellow cartridge without first multiple aggressive flushes with Windex with Ammonium D (followed by water flushing). So, pick one or the other but do not refill the OEM Yellow cartridge without properly flushing it first. Ricardo Quindere and The Hat like this. Thanks, I didn't want to mess with flushing it I'll just pull the chip and pitch it. Thanks! I'll just pull the chip and pitch it. Thanks! I thought he meant throw away the CLI-42 cartridge ("flushing it") after taking the chip off, but, clarity is key. I do realize the importance of the "antifill" chip installed by Canon. I purchased some empty but unflushed cli8 carts off ebay so ill use those. Is there a source for reliable cli42 chips? Otherwise I guess ill be doing the chip swapping for the set. At least until I can get more chips. I guess ill be doing the chip swapping for the set. Wow, you only need to dump the CLi-42 yellow cart, all the others can be just top up with your new inks, O’ by the way you can let the OEM yellow go empty but don’t let all the rest go past the low ink warning.. I'm not explaining myself. I will use7 of8 of the oem carts. I will remove the chip from the yellow and retain the chip and throw out the oem chipless cart. I will then install a pc- inked yellow with the retained chip from the yellow that I received with the printer. Then i will procure a set of 8 empty oem cli8 carts and fill them with pc inks and remove all cli8 chips. Then when i find the need to replace any of the installed carts ill remove them all, remove the cli42 chips, mark them so I track which color they came from, install them on the filled cli8, and install the m into the printer. Then top off the removed carts and rinse and repeat. I have no chip resetter so I guess I'll have to perform the button pushing procedure to bypass the printer telling me its empty. Is there a source of chips for cli42 carts i could install on my2nd set?